Our Digital Planet Phase 2 is now in the planning stage. 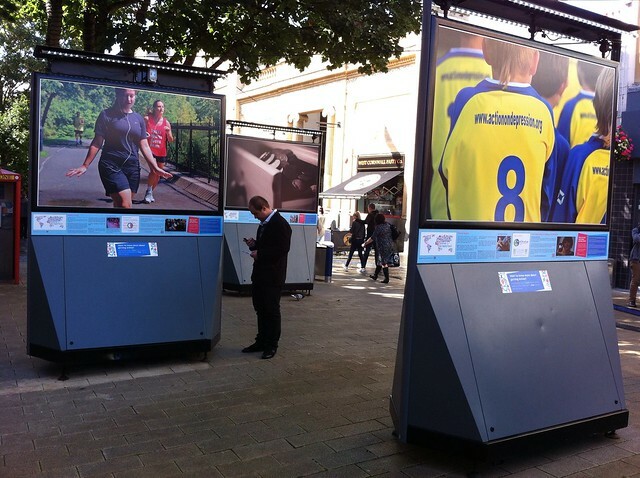 We are looking for cities, towns, neighbourhoods and organisations to come forward to host the Our Digital Planet 2013 tour. We can offer the opportunity to be part of one of the highest profile digital inclusion initiatives, reaching people who have so far missed out on the digital revolution, including many of those in danger of losing out by the move of services and welfare benefits online. You’ll also have a facility which is a major enhancement to the local environment, as well as a prime showcase for any technology or digital inclusion products or services you may wish to promote. Some history. 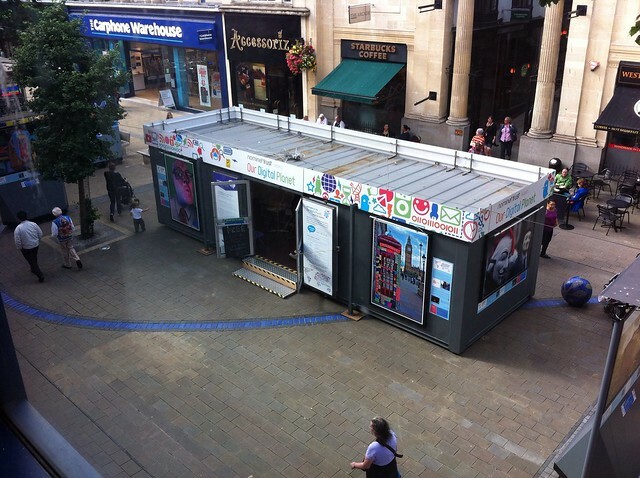 In the Autumn of 2012, Our Digital Planet toured several cities in the UK, taking Digital Inclusion to places of greatest footfall. As the project moved from city to city it gathered momentum and profile, culminating in a fortnight in Glasgow which saw record numbers of people through the doors and some very interesting barriers to digital inclusion tackled head on. Now, the planning is beginning for Our Digital Planet – Phase 2. 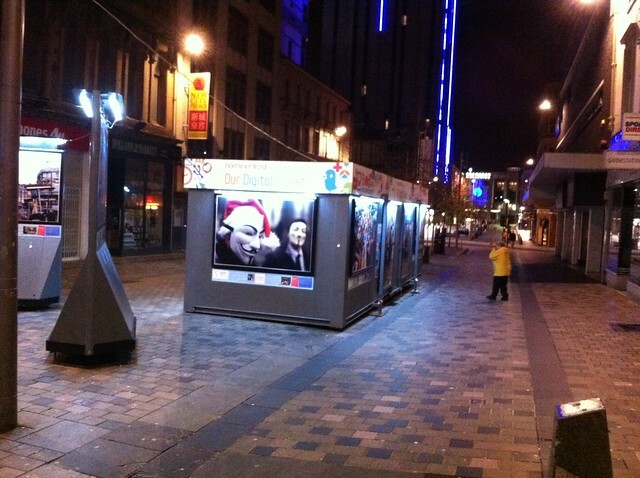 The first phase was very much organised and directed by Nominet Trust as their project, with the technical aspects delivered by wecommunic8, and the management of the Internet Station carried out by myself, in three locations, and by Lloyd Davis in two other places, under contract to Nick Booth‘s company Podnosh. The next phase will go forward as an independent project managed in partnership by myself and wecommunic8, with some support from Nominet Trust. To make it happen we are going to need lots of support from the community out there. So, for those who have not been following the story so far, what is Our Digital Planet? Well, it’s a touring exhibition which showcases the power of the internet and offers direct, personal support to those whose interest is stimulated. 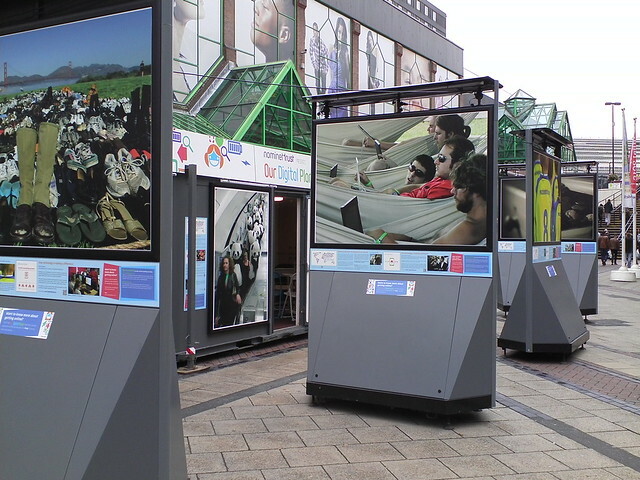 It consists of a display of annotated photographs showcasing the power of the internet (you can see some of them here), arranged around a portacabin (the Internet Station), whose external walls are clad with similar photographs, and, within which, are 5 computer stations, some comfortable seating and tables, and a plasma display screen. Internet access from the Internet Station is provided by a 3G router. At the bottom of this post, I have posted links to previous posts of mine which detail some of the results that came out of Phase 1. If it’s stats you need, then, by the end of the Phase 1, we were recording more than 100 concrete, recorded, cases of people helped with digital inclusion and digital literacy issues per two-and-a-half weeks in each town, thousands of people were seeing the display materials and hundreds were spoken to and given a non-recorded instance of advice. It also provided opportunities for a considerable number of local projects and agencies, including libraries, regeneration agencies, UK Online Centres, and digital inclusion projects, to meet potential new clients and showcase their services in a new location, where high footfall was more or less guaranteed. In the first instance, we need expressions of interest from cities, towns, neighbourhoods, and agencies who would be interested in hosting Our Digital Planet for at least a fortnight (or longer) in your area. Please email your expression of interest to me at john.popham@johnpopham.com with “EOI – Our Digital Planet” in the subject line. An EOI commits you to nothing at this stage, it simply helps us to have some measure of the likely level of demand. I should stress that we are still developing the model for Phase 2, and it may be that we will need each locality to make a financial contribution to hosting the project. But, don’t let this put you off, it might not come to that, and, if it does, we will work with all local partners to identify funds. We are also looking for sponsors. As well as financial contributions, we are looking for anyone who can provide with materials and services in exchange for a high profile marketing opportunity. We need organisations who can supply laptops, tablets, internet connectivity, display screens, volunteer support, as well as cash. We also need expressions of interest from agencies interested in partnering with Our Digital Planet. The project works best when we have a group of people helping out and engaging with people. 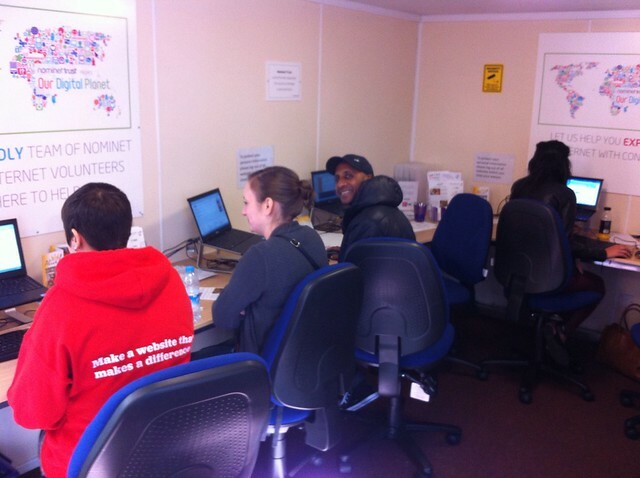 Agencies such as libraries, regeneration agencies, UK Online Centres, local digital inclusion projects, private companies and others have all sent volunteers down to help staff the internet station and attract new clients. In most of the locations where Our Digital Planet has operated, there has been someone who has expressed regret that it is leaving as the run has come to an end. There is no doubt that a major presence in key locations is a draw, has an impact on both the environment and people’s consciousness, and contributes to the “normalisation” of internet use. These are the benefits of continuing with a high profile touring exhibition as a hook to bring people to the keyboard, or, more likely, tablet. And it is extremely important that we re-double efforts to bring the reluctant and disengaged online at this time. The Government’s moves to a Digital by Default strategy as well as the forthcoming introduction of Universal Credit, which will be managed primarily online, threaten to leave many digitally excluded people disadvantaged. It may well be that these events provide the Tipping Point which forces them online. They will do so reluctantly, and it may feel like a punishment. This could well be counter-productive. I think we have a very short window (possibly as short as 12 months) when we need to pull out all the stops to get people to see the benefits of being online to all aspects of their lives, and, in particular, that it can be real fun, like it is for most of the rest of the population. I think lots of people have a responsibility in this respect, including older people who have already embraced technology, charities and support organisations, employers, social housing providers, care homes, and health authorities. This is why I think Our Digital Planet is such an important project at this moment in time. Please get in touch to help us make Phase 2 happen. This entry was posted in Digital Inclusion, Technology in the Outdoors. Bookmark the permalink.